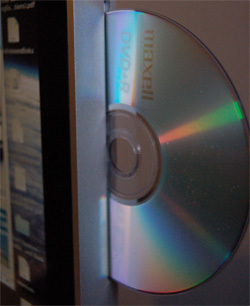 DVD-R and DVD+R are two competing technologies that use different formats. Both standards are officially approved and supported by two different forums, which constitutes of number of companies. The DVD-R(“dash R”) is supported by the DVD forum which was founded by Mitsubishi, Sony, Hitachi, and Time Warner. DVD+R is supported by DVD+RW Alliance, which is backed by Sony, Yamaha, Philips, Dell, and JP. The main difference between the two formats lies in the underlying technology which is generally unnoticeable to the end user. DVD-R use LPP (Land Pre Pit) system for tracking and speed control. While DVD+R uses an improved ADIP (ADdress In Pregroove) system which makes the ADIP system more accurate at higher speeds. DVD+R(W) has a more robust error management system than DVD-R(W), allowing for more accurate writing to media independent of the quality of the media. In addition, more accurate session linking methods used in DVD+R, results in fewer damaged discs than DVD-R. Both formats have the same storage capacity, with 4.7 GB for single layer discs and 8.5 GB for double layer ones. Although both formats are directly incompatible, there are hybrid drives available which can read both formats. Hybrid drives usually labeled as “DVDÂ±R” . 1. DVD+R has more robust error management system than DVD-R.
2. Session linking in DVD+R results in fewer damage in discs. 3. DVD+R may be more accurate in high speeds. 4. Both formats have same storage capacity. Have Comments, Feedback or Questions?. Please feel free share with us by writing below. Lathan K. "Difference Between DVD-R and DVD+R." DifferenceBetween.net. June 5, 2018 < http://www.differencebetween.net/technology/difference-between-dvd-r-and-dvdr/ >. 1. DVD-Rs are overwhelmingly more popular than DVD+Rs for people who burn DVD videos. This is because for older DVD players, say 5+ years and older, DVD-Rs are more compatible. 2. For serious concerns about error correction, DVD-RAM is actually the best format, but it’s not popular at all for mainstream consumers. Tomas: So where is YOUR contribution to the article?